I couldn't find a T-Shirt that read; "ShowFood Chef Went to FoodBuzz Festival and All I Got Was This T-Shirt". So instead, I'm giving you this recipe that was inspired by one of the exquisite courses prepared for our Gala Dinner. I really enjoyed the dinner catered by Paula LeDuc Fine Catering in San Francisco. I was amazed at the consistently well-cooked scallops and lamb. Those are not easy to cook well for a crowd. Everything was presented so beautifully and paired perfectly with Bonny Doon wines. I attended the Video Blogging session with ChezPim, RhodeyGirl and FoodWishes. The biggest take-away from the session was a renewed sense of ambition - just do it, go for it, try new things. He would be fish cakes in the hands of the gorgeous and adorable Mary Sue Milliken of Border Grill, etc. fame. ...but we could only take pictures and not eat until later at the Pavilion. Once, at the Metreon, we enjoyed the sky-high views of San Francisco and blogger-blabbered in the sunshine until they opened the doors. Once the chow-bell rang, all food heaven broke loose: Poached Gulf Prawns And Chile-Gazpacho from the Waterfront Hotel. Prather Ranch Meats - "Whiskey soaked maple sausage - hello, are you dating anyone?" Cream of mushroom from Americano at Hotel Vitale. Go Pop Candy found on Foodzie.com along with many of the artisan foods that popped. After a quick rest (AKA: more drinks in the lobby bar) it was time for the Gala Dinner presented by Cooking Channel and wines by Bonny Doon Vineyard. Our next course (not pictured) was a Rosemary Garlic Infused Rack of Lamb w/Wild Mushrooms and Butternut Squash Puree (paired with 2006 Bonny Doon Vineyard Le Cigare Volant). w/ Orange and garnished with a toasted Parmigiano nest. Good Food and wonderful people - they're hard to forget. Blogging is one way to journal about moments and meals that you want to share. I loved the idea of Show and Tell in school, it always gave me a chance to see into my class mates lives and personalities beyond the playground and tiled world of plastic desks. Show Food Chef is my way of letting you (when you have time and desire) into my world. This week I wanted to develop a recipe that captured the taste of the mellow tart served to me during the Gala Dinner. This is NOT their recipe, but I have to say it was damn good. I hope you have the chance to try it. 1) Wash and cut the Golden Beets in half. Place cut side down into a baking dish. Pour in 1/4 cup water, cover with foil and roast the beets for about 40 minutes at 350F (or until fork tender). 2) Remove from oven, uncover and let rest/cool for a few minutes. Peel the tender beets and cut into large chucks. 3) Put the beet cubes into a food processor and puree. 4) Add the buttermilk, eggs, zest, cinnamon, salt & pepper. 6) Pour beet custard into a bowl and stir in the goat cheese until just incorporated. When the pie or tart shells are ready and prebaked, pour the beet custard into the shells and bake at 350F for about 20-30 minutes, depending on size of tarts or pie. They are ready when the center of the custard is just set and not loose. Remove and cool for a few minutes before carefully taking out of pans. Serve with lightly dressed Arugula on top, and garnished with candied red beets or a drizzle of cilantro glaze. 1) In a food processor - pour in flour and salt, then add the butter cubed. Pulse to cut in the butter, just until its small pea-size bits. 2) Pulse in the water a little at a time just until the dough starts to hold together. 3) Remove dough to floured board and using palm of one hand, push dough forward and then pull into a ball (about 2 times only). Divide dough into halves, form a disk, wrap in plastic and chill for at least 1 hour. 4) Roll each disk out between plastic wrap, removing and sprinkling with tiny bit of flour as needed to roll easier. When the dough is rolled, cut into size as needed for tart or pie pan and place in pan. 5) Chill the pie shells for about 30 minutes (this helps keep them thin and solid when baking). 6) Cover the bottom of pie shell with parchment and fill with pie weights or beans. Bake in 350F oven for about 10-15 minutes (depending on size of pans). It should not brown, but just get a nice pre-baked texture to help prevent soggy crust when filled. 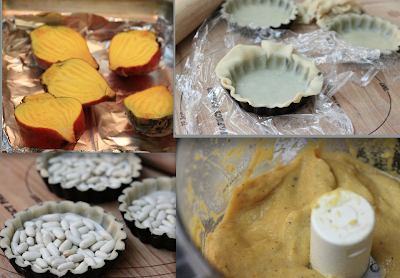 7) Fill pie/tart shells and bake as instructed by your recipe. Cathy, what a great post. It sounds as though you had a great time. I love your recap as well as your tips on what words not to use. It gets so redundant sometimes, don't ya think? These weekends are so inspiring....good for you! Oh man that trip looks sensational (I am trying to use special words). I am a blogger too and have never ventured out into the community beyond cyber space. You have given me inspiration and guts. Blogger meet ups, here I come. I hope the fashion and life style blogger's have food like you had. Taste bud enticing! You are right! That Golden Beet Tart was absolutely wonderful. I'll be trying my hand at recreating it, too. Good to see you at Foodbuzz Fest. Beautiful... both the tart and the commentary on Foodbuzzfest!! It truly looked like a wonderful "bonding" event!!! The beet custard sounds very good and different from the usual preparation - would make a lovely starter for a fall dinner party!!! Wow -- Impressive that you recreated that tart!! 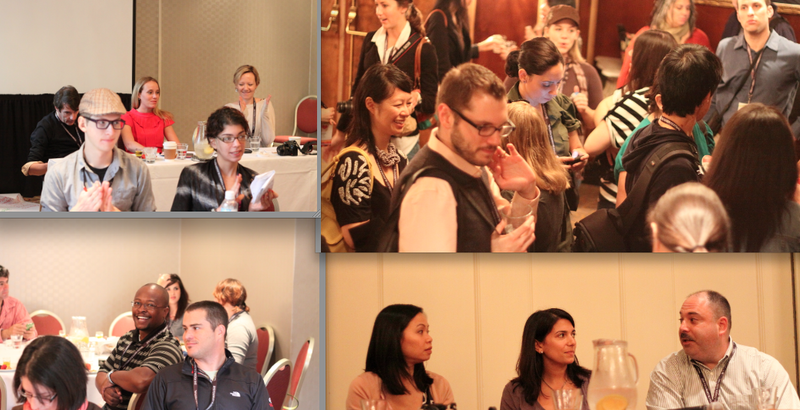 Excellent recap of the Foodbuzz Fest too. It was great meeting you. Bummer that niether of us won the New Zealand trip, which would have been awesome, but at least we wont have to pay taxes on it. That's what I'm telling myself to feel better, hahaha. Hope you have a fabulous holiday season!!! Your tastebuds must be well trained to ascertain all of the ingredients in that scrumptious looking tart. I am always looking for vegetarian dishes and this one looks worth a try this week.Check out my tart (apple/cheese galette) on my blog, http://www.greeneyedsusan.blogspot.com for another vegetarian option.